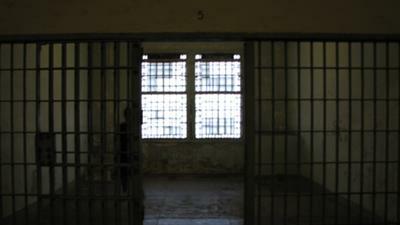 I took this photo in Aug 2009 of just a empty cell. When I got home and look at all the pics I noted a shadow of a person with no feet or hands. Can you explain it? That is freaky I visted that same place and I have a picture of the same thing but in a diffrent place I just don't know how to upload it! Wow, that's creepy well it seems to look like a real ghost were there people behind you? I don't think I can sleep well tonight..
Wow! I only seen the figure on the left till I really studied the figure on the right! It does appear to be that of a man sitting on something. Maybe something that used to be a bed! Real good pic! I love this stuff! Probably just a shadow or something. I am so creeped out anyway. There is a contrast of these two entities and that is black 'n white. This is a great picture. Excellent. I see it too. I'm into ghosts anyway, but it looks like a prisoner sitting on his bunk with his back hunched over. I am going to San Fransisco tomorrow and bring back my own ghost stories and possibly figure this one out!!! I like the image as it seems natural. I agree with seeing both figures. However, the figure on the right does not look like he is staring at your camera, he looks as though he is hunched over sitting on what may have been a prison bed. The thing on the left looks very natural, but I think shoes can't be seen if one looks very closely. Great picture though. I couldn't see any other beings in it though. Do you have anymore you can add from that same visit? Actually, there are two shadow people; the dark form on the left of the cell and a lighter, transparent image on the right, who appears to be looking straight at the camera. Anybody else notice this? As few said, there is nothing inside the cell.. I do believe in ghosts but this is not beliveable since nothing can be found even after a hard try. Better luck next time.. I'm a skeptic about ghosts but after seeing this I'm not sure what to think anymore. It can't be a shadow because it's behind the bars and it has no feet. This is the most convincing picture of a ghost I have ever seen. I don't see it. I Think it's a shadow. Actually, I don't even see a shadow. I see both! I also had my kids look at it. They see both as well. While I think the one on the left maybe the cell door opened just right so it looks like a form. But the one on the right...holy cow!! I've always been interested in ghosts, and this one looks like the prisoner who died in that cell! (I'm not kidding, the area IS haunted) I really like this picture, it helped me get closer to solving the mystery of the ghost! I see the one on the right! Looks like he's at the bars looking right at your cam! I couldn't see anything on the left though. I watch T.A.P.s all the time and they have visited there before too and they have caught things on video. I believe it 100%. this is a very good PIC! ive seen this picture befor i know what you mein it is hard to understand but it is there how do you understand something that isn't human or alive do you no what this picture is its a ghost! That was sooo cool. But i think you might be lying. Nice try though. Glad it was you not me! Ive been there at night and that place is scary as hell. You lucky to have captured this on film! Good luck with your ghost huning! There's no explanation for that one, nice pic! When I look at this shot I get the name Marty he a small man. Looks like he has his shirt collar rolled down-you can see it on his shoulder. That is the first shadow person i've seen at that place.It does look like it has no hands or feet.It also looks like it been in that cell for a while. And thank you for your photo. My explanation is that either a person is standing there and the bars of the cell are creating an optical illusion making the figure appear unusual or that the figure is not a person at all and some other object in the room that appears to be a human form. Or it's an apparition, because I don't see feet at the bottom of the legs.